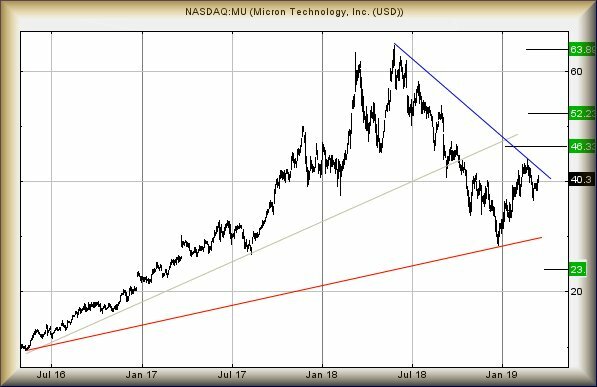 Micron Tech. #Nasdaq #CAC40 We enjoy glancing at oddballs, if only to prove we pay attention to readers emails. To be honest though, what prompted interest was simultaneously seeing the company name on a memory chip which was laying around on my desk, awaiting its chance to breathe new life into a PC. It will surprise readers we’re not early adopters of technology, quite the converse. An in-house mantra of “if it ain’t broke, don’t fix it” had ensured all our systems were 32bit, operating with 4gb ram***, but running Windows 10. The purchase of a new laptop exhibited how Windows 10 could run if on a 64bit system with 16gb of ram, along with a solid state hard drive. In the period since, our desktop PC’s operating systems have changed to 64bit, their memory substantially upgraded, and we’ve got super fast hard disks. Unfortunately, a change to work practices was entailed. It used to be standard to turn on the PC, then go make coffee. By the time a perfect Latte was ready, the computer would generally be awake, ready for the day ahead. Now, each upgraded PC takes around 15 seconds to boot. A residual feeling of lazy guilt pervades, arriving at a machine which is now patiently waiting, the screensaver displaying pictures of cats, dogs, and the occasional snow covered mountain (better known as the view from the office!). As for Micron Technology, their share price is showing some potentials. At time of writing, it’s trading around 40.37 and need only exceed 42.32 to better BLUE on the chart, the downtrend from May of last year. An event such as this calculates with the potential of continued growth to an initial 46.33 and better still, if exceeded it allows 52.23 to make a guest appearance as a potential high. Visually, the secondary ambition is interesting, matching a high from last year. It looks very possible some sort of glass ceiling awaits, should our calculation of 52.23 be met. In addition, it would make a longer term 63.8 a viable target, meeting the shares all time high from last year! For now, it appears worth watching in the days ahead. The price currently requires trade below 33.25 to cause a loss of interest in its longer term potentials. *** 32bit operating systems can only access a maximum of 4gb memory, regardless of how much is fitted to the machine. Pingback: Financentra | Just some thoughts on Micron Technologies.